The CIRI Foundation (TCF) offers project grants to non-profit organizations, tribal organizations, and individuals sponsored by a non-profit organization who are Alaska Native original enrollees of Cook Inlet Region, Inc. and/ or their lineal descendants. These grants are available to support projects that affect and/or involve Alaska Native beneficiaries of CIRI and further the education and heritage goals of TCF. 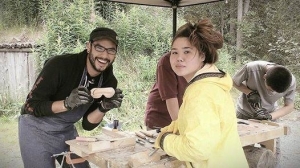 There are 3 different Project Grant Categories: Education Project Grants, Heritage Project Grants, and A Journey To What Matters: Increased Alaska Native Arts and Culture Project Grants. Applications for project grants must be received on or before the deadline in order to be considered for funding. There are four project grant deadlines a year. Project grants require paper applications, see below. Curious about previous projects, or want to share your success? See Share Your Story to send word about your project, and check out the stories at the bottom of our homepage. Applicants are encouraged to contact a TCF Team Member before submitting an application. We are happy to guide you to the correct category and application. Call (907)793-3575 or (800)764-3382 or email us at tcf@thecirifoundation.org to chat about your project idea.